The first video below features a short fly over of the golf course, in particular the opening and closing holes. See highlights from the 2015 Scottish Boys Championship held at Dunbar. The video below features fantastic footage of Dunbar Golf Club and its stunning location on the North Sea coastline, and includes contributions from Scottish Tour Professionals Paul Lawrie and Richie Ramsay, journalist Jock MacVicar, and our Director of Golf, Jacky Montgomery. Part 2 contains great coverage from the latter stages of the 2015 Scottish Boys Championship and interviews with the two finalists: Will Porter (Champion) and Ross Callan (runner-up). See below. 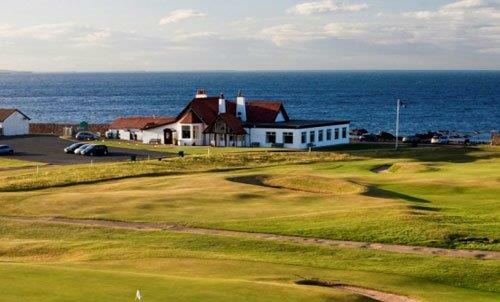 For more insight into the course and the club itself at Dunbar, please see the video below. Filmed during the 2011 Scottish Boys Championship, Jacky Montgomery (Director of Golf) gives you the lowdown on 'Scotland's Pebble Beach'. The wind is likely to be factor at some stage during your round at Dunbar... all we can advise from the following video is make sure you have some good brakes on your trolley! See below for things that can go wrong! See below 'Scotland's Golf Coast' video featuring stunning footage of Dunbar (at 2.49) and other local courses.